Imagine yourself snorkeling in pristine tropical waters on one of our amazing Caribbean cruises! Snorkeling in beautiful clear water is a favorite pastime of many. The Caribbean is considered to have some of the most beautiful areas for snorkeling. 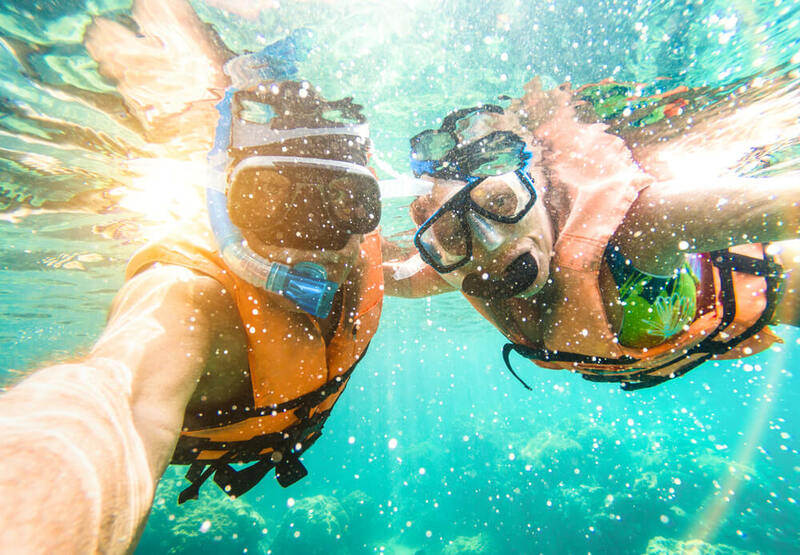 Here at CruiseExperts.com we know the best snorkeling cruises, and we are ready to help you find the one that provides just what you want for your time, schedule and budget. The best snorkeling in the Caribbean can be enjoyed on a great cruise to the islands of the Caribbean! Click here to browse our Caribbean cruises! Our cruise was absolutely fantastic, we really loved it! It was our honeymoon and we will always remember!Thank you very much for your service and your patience with my many questions and my bad English! 🙂[From Germany] — Ingrid K.
You’ll find the best Caribbean snorkeling in the following list of destinations. Remember, we can answer any questions you have and our services are always free! We’ll help you find a cruise that fits your budget and any time restraints you may have. We want your snorkeling vacation to be fun and exciting, so give us a call at 1.888.804.CRUISE (2784) to get your Caribbean cruise booked. Boaby Rock Point is a favorite for beach snorkeling, and there is a beautiful reef in shallow water. There is plenty of lush sea grass, colorful fish, and coral and sea fans. A nice spot if you like to do a little underwater photography. The incredible Governor’s Beach has easy access, and you can find old jetty rocks, red sea fans, and small reef fish close to the beach. To see ancient coral shelf and gulley formations Cockburn Town Beach and English Point are fun areas for exploration, but have little in the way of sea life. Pillory Beach (north) has a variety and abundance of old coral formations and features. Playa Dorado, with its two miles of beach is a popular snorkeling area in the Dominican Republic. It has shallow water that gives way to coral reefs making it excellent for snorkeling. Snorkeling enthusiasts have come to realize the Dominican Republic offers an excellent snorkeling, diving, and swimming adventure. The reefs in the Dominican Republic are teeming with life including nurse sharks, giant crabs, and green morays. Cruising the surface is perfect for the snorkeler, and experienced divers will enjoy the ability to go deep into the water.